So enamoured was I with the chocolate, lemon curd and strawberry combination after I made these chocolate waffles, that I knew immediately that was what I would use for my birthday cake last week. What I didn’t then know was that I would add pomegranate to the mix. 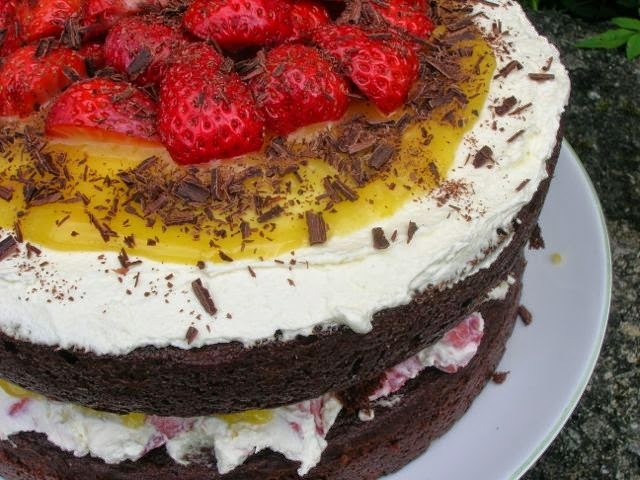 I give you my uber lush chocolate pomegranate cake with lemon curd and strawberries. When I was sent some pomegranate juice drink from The Simply Great Drinks Co, I thought it would make a fabulous addition to my cake. And so it proved to be. Neither CT nor I are particularly keen on sweet drinks and this did taste very sweet. However, we found that a dilution of one third juice to two thirds water suited us very well; it tasted good and was particularly refreshing during hot days. It made for a rather tasty cocktail too – recipe to follow. In fact I only just managed to nab some for my chocolate pomegranate cake before it ran out. The pomegranate flavour was to the fore and the colour was deep and jewel-like. With pomegranates trending as the latest superfood, consuming some has to be a good thing. It must be said, however, that PomeGreat, as this drink is called, contains only 30% pomegranate juice. The rest is made up of water and other fruit juices from concentrate. As some of you may remember, I carried out a cocoa powder tasting trial some time ago. It was Food Thoughts organic and fair-trade cocoa that came out best. Food Thoughts is available in Sainsbury’s, but is not stocked by the Co-op or anywhere else in Liskeard, so I don’t get to use it very often. Luckily, Food Thoughts kindly sent me a couple of pots recently, so it was this cocoa I used in my birthday cake. On the day of my birthday, friends hosted an afternoon tea party for me that ended up lasting long into the evening. It was a jolly affair and it even stopped raining long enough to have a walk around their beautiful garden and to spend half an hour sitting out on their newly created terrace. I did much of the baking for the occasion including my birthday chocolate pomegranate chocolate cake and the gooseberry mini cakes that have were featured in a previous post. Surprisingly, the most popular bake of the day turned out to be some little muffins made from the gleanings of a weeding session down at the plot. They were modelled on this recipe for carrot and beetroot muffins, only I used tender leafy greens instead of the carrots and beetroot and omitted the cocoa powder. Greens, walnuts and goat’s cheese is a winning combination I found. I also made brownies, peanut butter cookies and madeleines. 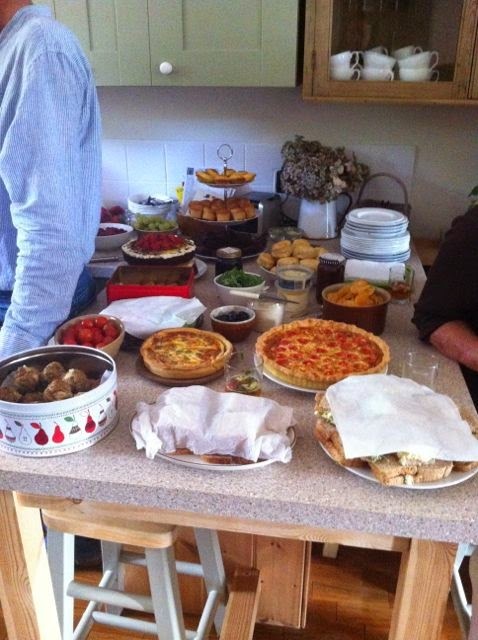 My friend made sandwiches, quiches and scones, so we had a veritable feast. The cake went down a storm. No surprise there. The tangy fruity creamy combination encapsulated summer perfectly. The chocolate cake itself was succulent with a light but substantial sponge that was infused with a hint of pomegranate. I made the lemon curd too, of course. A couple of days after my birthday when the chocolate pomegranate cake had long since disappeared, my mother turned up with another birthday cake. Lucky me. I don’t get cakes made for me very often, so I was quite delighted. It was a well textured light fruit cake with a layer of marzipan beneath the icing and although very different, it was equally delicious. Thank you Mamma. A celebration chocolate cake made with pomegranate juice then layered and topped with cream, lemon curd, strawberries and chocolate. Cream butter sugar and golden syrup until light and fluffy. Beat in eggs, one by one, alternating with a spoonful of the flour if necessary to prevent curdling. Sieve in the flour, baking powder, almonds and cocoa and stir until just combined. Add the pomegranate juice and stir gently until just combined. Scrape into two prepared 21 cm cake tins or silicone moulds and bake at 180℃ for 30 minutes or until well risen and a skewer inserted comes out clean. Leave to cool in the tins for ten minutes, then turn out onto a wire rack to cool completely. Whip the cream until peaks form. Divide into two and fold in half of the strawberries. Cover one of the cakes with the strawberry and cream mixture, then spread on 2 tbsp of the lemon curd. Place the remaining cake on top and cover this with the plain whipped cream. Cover with the rest of the lemon curd, the strawberries and the chocolate shavings. 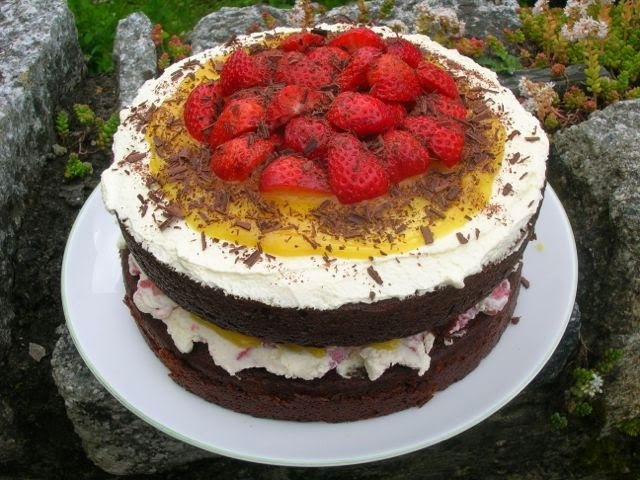 I am sending this chocolate pomegranate cake with lemon curd and strawberries off to Emily over at A Mummy Too for her Recipe of the Week. 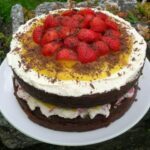 It also goes to Cook Blog Share with Lucy over at SuperGolden Bakes, Tasty Tuesdays gets a look in too with Vicki at Honest Mum and to Jenny over at Mummy Bakes Cakes for July’s Celebration Cakes and Bakes. Thanks for visiting Tin and Thyme. If you make this chocolate pomegranate cake with lemon curd and strawberries, I’d love to hear about it in the comments below or via social media. Do share photos on social media too and use the hashtag #tinandthyme, so I can spot them. For more delicious and nutritious recipes, follow me on Twitter, Facebook, Instagram or Pinterest. Chocolate Pomegranate Cake. PIN IT. Thanks Vicki – link and badge are both there. Happy birthday (belatedly) this looks like such a beautifully rich cake. I am intrigued by the pomegranate juice in the batter – though I much prefer using the juice in cocktails! Thanks for linking to #CookBlogShare. The pomegranate juice worked very nicely in the cake Lucy, giving both moisture and flavour. An amazing looking cake packed full of gorgeous flavours. Beautiful! Happy belated birthday! This sounds delicious with that combination of different flavours and one I’d find myself quickly addicted to. You have managed to combine my favourite ingredients into one delicious cake. Let my birthday roll around soon! What are you planning on doing for yours Madeleine? Happy belated birthday! I love the way you come up with flavour combinations which sound bizarre, but still produce something delicious every time! That looks amazing Choclette. I’m going to top my next victoria sponge in that style. Gorgeous! ooh i love pomegranate and chocolate <3 I’ll definitely give this recipe a go! Thanks Lucinda. It’s not a combination I have tried very often, but it seems to work. Thanks CC. Tastes good too – honest! Happy belated Birthday, Choclette. The layered cake looks amazing. What a beautiful looking cake. Looks absolutely delicious! Happy birthday too! Thanks GG – I shall be sad when the strawberry season is over and my lemon curd has run out. I love that combination of flavours, especially on a summer day. Happy birthday – rather belatedly I’m afraid. Thank you Phil. All good wishes gratefully received – whenever they occur . 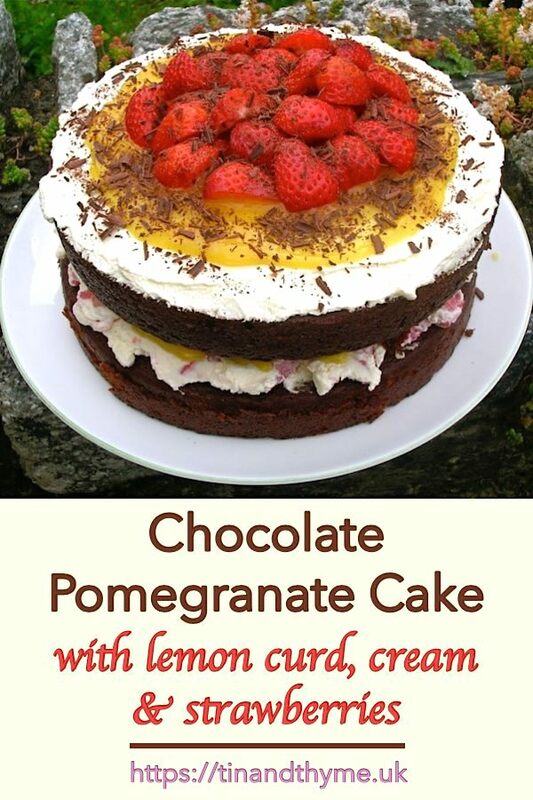 What a fabulous recipe I would never have thought of using pomeo flavour in a cake ! well done, another fab easy bake! that birthday party sounds so good and love ur tip about using greens and walnuts , am off to read that recipe now! 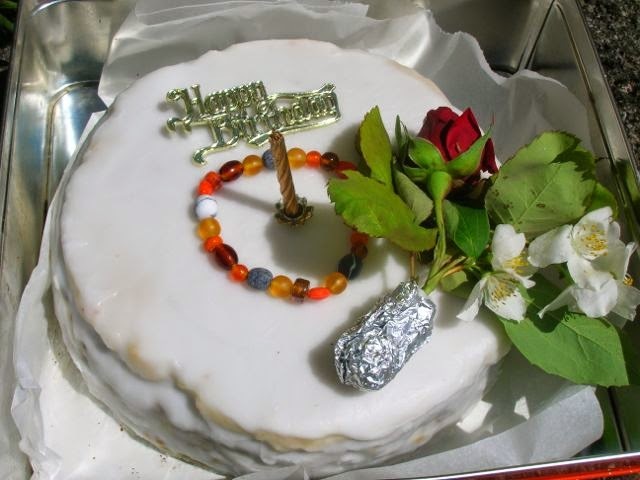 A second birthday cake too – can’t get any better can it ? Thanks Manjiri, I do like to surprise folk where possible. Getting the balance right and not giving them a shock is the issue. Luckily all worked very well here. This is a GORGEOUS cake! All of the flavors together sound so delicious! Sounds wonderful, Choclette! Your party sounds wonderful, too! Any excuse for an afternoon tea party, I always say. Thank you Johanna. I’m with you on the juice and always water down if I’m drinking. There is something about bubbles and summer and in this hot weather fizz somehow seems to be more thirst quenching. Thanks Emily, if I hadn’t got a load of lemon curd in the fridge, I’m not sure I would have thought of it either, but I’m very glad I did. This looks so moorish and perfect for a grown up birthday – it sounds like you had a great time. Thanks for linking to Celebration cakes and bakes, I’m catching up after summer holidays took over my life. Thank you – all those glorious days of summer already seem such a long time ago!